The original Super Meat Boy was something of a phenomenon when it launched back in 2010. Critically praised and commercially successful, the game’s unique visual design and rage-inducing difficulty struck a chord with players the world over. The game was ported to many platforms in the years that followed, culminating with its arrival on the Nintendo Switch earlier this year – an arrival that saw very strong sales. Clearly, the demand for more Meat Boy is strong, and Team Meat is ready to meet that demand with their newest venture: Super Meat Boy Forever. Forever makes a few changes to the core gameplay. Unlike the original, where you were free to move Meat Boy around as you please, Forever has him running forward automatically. This design choice likely has its roots in Forever‘s early days of development, when it existed as an attempt to create a more mobile-friendly Meat Boy. If you’re afraid this makes the gameplay more shallow or otherwise cheapens the experience, fear not. The change actually works really well, and the modified movement mechanics challenge you to refine and improve your skills in different ways. The game’s increased move set matters just as much: you can duck under low-hanging obstacles while you’re running, and you can punch enemies out of the way to keep the flow going. Meat Boy is back – and he’s pissed. Unlike the original game, which had discrete and concrete layouts, levels in Forever are randomly generated from a pool of pre-designed “chunks.” The game uses some logic and rules to smooth out how these chunks are stitched together so levels don’t feel like a random mashup of indistinct pieces. This chunk-by-chunk approach may become more identifiable in the full release, but in the handful of levels we played, there was no obvious indication that levels were being procedurally generated in this way. These chunks also help determine the overall difficulty of stages, and this matters with the return of Light and Dark Worlds, with the “dark” versions of levels providing an additional layer of challenge. Auto-running aside, Forever crams pretty much everything that you loved about the original game into a new, but still quite familiar, package. The character art, richer animations, and new vectorized assets look great; Forever is every bit the quirky visual experience that its predecessor was and continues to be. The controls are tight and responsive, just as you’d expect, and the core gameplay loop of tough challenges and quick death lives on in this title. It may have taken eight years for Meat Boy to return, but all signs point to the wait being well worth it. 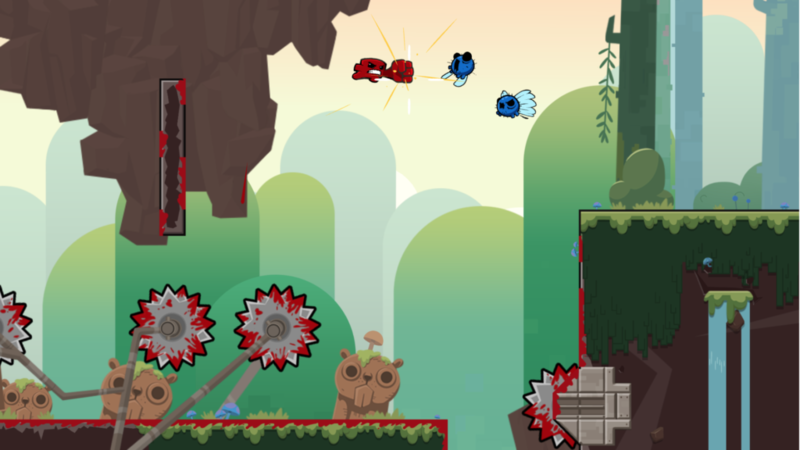 Super Meat Boy Forever has a tentative release date of later this year. The game will be available on Xbox One, PlayStation 4, PC, and Nintendo Switch; it will arrive on iOS, Android, and Linux at some point after its release on consoles.